This article is about Plato's dialogue. For the prophet for whom the dialogue is named, see Euthyphro (prophet). Henri Estienne's 1578 edition of Euthyphro, parallel Latin and Greek text. Euthyphro (/ˈjuːθɪfroʊ/; Ancient Greek: Εὐθύφρων, translit. Euthyphrōn; c. 399–395 BC), by Plato, is a Socratic dialogue whose events occur in the weeks before the trial of Socrates (399 BC), between Socrates and Euthyphro. The dialogue covers subjects such as the meaning of piety and justice. The Euthyphro dialogue occurs near the court of the archon basileus (king magistrate), where Socrates and Euthyphro encounter each other; each man is present at the court for the preliminary hearings to possible trials (2a). Euthyphro has come to present charges of murder against his own father who, after arresting one of his workers for killing a slave from the family estate on Naxos Island, tied him and threw him in a ditch where he died of exposure to the elements without proper care and attention (3e–4d) while Euthyphro's father awaited to hear from the exegetes (cf. Laws 759d) about how to proceed. Socrates is astonished by Euthyphro's confidence in being able to prosecute his own father for the serious charge of manslaughter, despite the fact that Athenian Law allows only relatives of the dead man to file suit for murder. (Dem. 43 §57) Euthyphro dismisses the astonishment of Socrates, which confirms his overconfidence in his own critical judgment of matters religious and ethical. In an example of Socratic irony, Socrates says that Euthyphro obviously has a clear understanding of what is pious or holy (τὸ ὅσιον to hosion) and impious or unholy (τὸ ἀνόσιον to anosion). Because he is facing a formal charge of impiety, Socrates expresses the hope to learn from Euthyphro, all the better to defend himself in the trial, as he himself is being accused of religious transgressions. Socrates asks Euthyphro to offer him a definition of piety or holiness. The purpose of establishing a clear definition is to provide a basis for Euthyphro to teach Socrates the answer to the question: "What is piety?" Ostensibly, the purpose of the dialogue is to provide Socrates with a definitive meaning of "piety", with which he can defend against the charge of impiety in the pending trial. Socrates seeks a definition of "piety" that is a universal (universally true), against which all actions can be measured to determine whether or not the actions are pious. That, to be universal, the definition of "piety" must express the essence of the thing defined (piety), and be defined in terms of genus, species, and the differentiae. Hence, the Euthyphro dialogue is technically important for the dialectics of theology, ethics, epistemology, and metaphysics. Indeed, Plato's approach in this dialogue is anachronistic, because it is unlikely that Socrates was a master metaphysician; nonetheless, Aristotle's expositional treatment of metaphysics is rooted in the Platonic dialogues, especially in the Euthyphro. 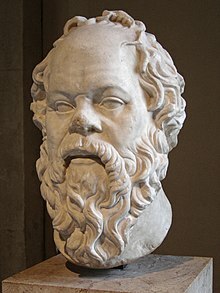 Ostensibly in order to better defend himself in an upcoming trial for being an impious citizen of Athens, Socrates asks Euthyphro for a clear definition of piety (holiness); he offers Socrates four definitions. Euthyphro's first definition of piety is what he is doing now, that is, prosecuting his father for manslaughter (5d). Socrates rejects Euthyphro's action, because it is not a definition of piety, and is only an example of piety, and does not provide the essential characteristic that makes pious actions pious. Euthyphro's second definition: Piety is what is pleasing to the gods. (6e–7a) Socrates applauds this definition, because it is expressed in a general form, but criticizes it saying that the gods disagree among themselves as to what is pleasing. This means that a given action, disputed by the gods, would be both pious and impious at the same time – a logical impossibility. Euthyphro argues against Socrates' criticism, by noting that not even the gods would disagree, among themselves, that someone who kills without justification should be punished. Yet Socrates argues that disputes would still arise – over just how much justification actually existed; hence, the same action could be pious and impious; again, Euthyphro's definition cannot be a definition of "piety". Euthyphro's third definition of piety is: "What all the gods love is pious, and what they all hate is impious." In reply, Socrates poses the question that would eventually become known in philosophy as the Euthyphro dilemma: "Is the pious loved by the gods because it is pious? Or is it pious because it is loved by the gods?". Euthyphro seems unsure as to what the question means and so Socrates applies a dialectic technique: an analogy, to clarify his question (10a). He persuades Euthyphro to agree that when we call a thing "carried", it simply because it is being carried by someone and not because it possesses an inherent characteristic, which could be called "carried". That is, "being carried" is not an essential trait of the thing being carried but a condition, a state of that the object is currently in. He then moves to what we call "beloved" (φιλούμενόν filoumenon). Is something "beloved" in and of itself (like being big or red), or does it become beloved when it is loved by someone? Clearly, the answer is again the latter, something becomes beloved when it is loved. So then, continues Socrates, something beloved by the gods (θεοφιλές theofiles) becomes so because it is loved by them, to which Euthyphro agrees and Socrates moves to the conclusion that reveals his contradiction: What is beloved by the gods cannot be pious. Euthyphro seems to be taken aback so Socrates reminds him the definitions he gave previously (10e). He had said that something is loved by the gods because it is pious, which means that their love follows from something inherent in the pious. And yet they just agreed that what is beloved is put in that state as a result of being loved. So piety cannot belong to what is beloved by the gods since according to Euthyphro it does not acquire its characteristics by something (the act of being loved) by has then a priori, in contrast to the things that are beloved that are put in this state through the very act of being loved. It seems therefore that Euthyphro's third argument is flawed. At that juncture of their dialogue, Euthryphro does not understand what makes his definition of "piety" a circular argument; he agrees with Socrates that the gods like an action because it is pious. Socrates then argues that the unanimous approval of the gods is merely an attribute of "piety", that divine approval is not a defining characteristic of "piety". That divine approval does not define the essence of "piety", does not define what is "piety", does not give an idea of "piety"; therefore, divine approval is not a universal definition of "piety". Socrates argument is convoluted not only because of its structure but because of the language used, and is said to have "reduced translators to babble and driven commentators to despair". The text presents the argument through a distinction between the active and the passive voice, as for example when Socrates asks about the difference between a "carried thing" (φερόμενον) and "being carried" (φέρεται), both using the word "carried" in the English translation. ... Are you not compelled to think that all that is pious is just? Yet, Socrates later says that the information provided in his question to Euthyphro is insufficient for a clear definition of "piety", because piety belongs to those actions we call just, that is, morally good; however, there are actions, other than pious actions, which we call just (12d); for example, bravery and concern for others. Socrates asks: What is it that makes piety different from other actions that we call just? We cannot say something is true, because we believe it to be true. We must find proof. Euthyphro then proposes a fifth definition: "Piety is an art of sacrifice and prayer". He proposes the notion of piety as a form of knowledge, of how to do exchange: Giving gifts to the gods, and asking favours in return. (14e) Socrates presses Euthyphro to say what benefit the gods perceive from human gifts – warning him that "knowledge of exchange" is a species of commerce. (14e) Euthyphro objects that the gifts are not a quid pro quo, between man and deity, but are gifts of "honour, esteem, and favour", from man to deity. (15a) In other words, Euthyphro admits that piety is intimately bound to the likes of the gods. The dialogue has come full circle, and Euthyphro leaves Socrates without a clear definition of "piety" as he faces a trial for impiety (ἀσέβεια asebeia). ^ a Greek given name meaning "Right-minded, sincere"; entry "εὐθύφρων" attempt to establish a definitive meaning for the word piety in Liddell, Scott, & Jones, An English–Greek Lexicon. ^ Stephanus page 5d: λέγε δή, τί φῂς εἶναι τὸ ὅσιον καὶ τί τὸ ἀνόσιον. ^ Cohen, S. Marc (1971). "Socrates on the Definition of Piety: Euthyphro 10A–11B". Journal of the History of Philosophy. 9: 4. ^ Stephanus page 12d: μόριον γὰρ τοῦ δικαίου τὸ ὃσιον. R. E. Allen: Plato's "Euthyphro" and the Earlier Theory of Forms. London 1970, ISBN 0-7100-6728-3. Wikimedia Commons has media related to Euthyphro. This page was last edited on 10 February 2019, at 22:41 (UTC).